The British Order returned to Scotland from England, planting many lodges during the nineteenth century. It is believed that Scottish militiamen carried the concept of free gardening to the Newcastle area in the Napoleonic period and founded lodges there, which took root and spread. A Lodge numbered 99 was opened at Newton Heath, Manchester in 1817. 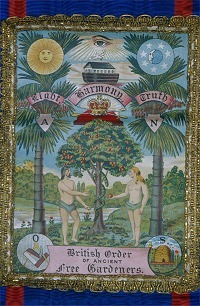 The Order thus predates any attempt to create a grand lodge and corresponding order in Scotland. In the middle 1880s the Order began a significant recruiting drive in the Edinburgh area and soon had around 20 affiliated lodges. In 1912, the Order formed a subsidiary that was approved under the Insurance Act: the British Order of Ancient Free Gardeners Approved Society. By the end of September it had enlisted 26 'branches' in the East of Scotland District. Most of these were lodges that had been opened under the Order some years previously. Others were long-standing lodges that retained 'craft' connections to one of the Scottish Orders (e.g. Penicuik Thistle of the Ancient Order). The PO directories show that the order's first home around 1885 was Buchan's Hall, 114 High Street, Edinburgh; six lodges were listed. In 1890 it was the Free Gardeners' Institute, 10 Broughton Street, Edinburgh. It then listed 15 lodges and a further 8 juvenile lodges (it appears to be the only order to have a youth wing). By 1900 it was installed at 12-14 Picardy Place, where the office adjoined the relocated Institute. The Order's East of Scotland District, later the East of Scotland Centralised District was also based there. The Order ceased to appear in the Directory after the 1972/3 edition.